Our dried white figs come from north Euboea, an island that has a long tradition in producing these honey-sweet fruits. The ripe figs are harvested from the trees in August and then dried in the sun for days in exactly the right temperatures, before being further processed and packaged. Their smooth, firm skin contrasts with their sweet, caramel-like inside. They are an ideal snack on their own and perfect for adding flavour in sweet and savoury dishes. Our raisins and currants come from the region of Corinth, the place which originally gave currants their name. They are dried in the sun and contain no additives. Our currants come from dark grapes and are characterized by a very deep colour and a rich aroma that is both fragrant and intense. A quintessentially Greek product, they have been produced in the region since ancient times and traded throughout Europe since at least the middle ages. Even today 80% of the world production is centred in Greece. They are extremely rich in antioxidants and polyphenol compounds. 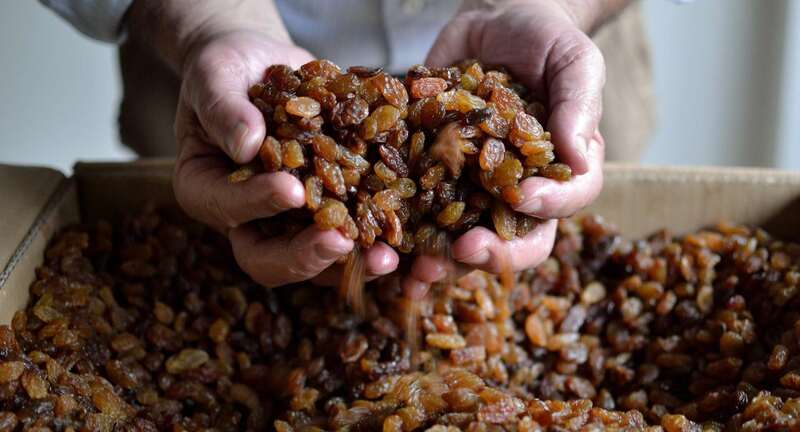 Our sultana raisins come from white seedless grapes, and are distiguished by their rich, sweet and fruity aroma with notes of honey.